Those of you who caught my October article on Upgrading Performance Management will be familiar with the trends and changes that shook up the field in 2016. Since Human Resources is constantly evolving, I thought I’d give you a jump on your 2017 planning with a quick run down of the three studies that, for me, turned up some of the most important insights into our field this year. The Impact of Performance Management on Performance in Public Organizations: A Meta-Analysis. If you want an overview of how performance management (PM) works across different organisations, a meta-analysis is the way to go. The authors looked at data from 49 studies evaluating PM in the public sector to see what worked, what didn’t, and where improvements can be made. To measure their effectiveness, the report graded the 49 individual studies on everything from data collection to performance management structure. Now, we’re managers not academics, so not every measure is of interest to us. However, if we focus on the assessments of benchmarking (its absence, limits, and structure), performance measures, and feedback; we unearth some valuable insight. Top of the list, measuring performance doesn’t improve it. That’s not to say it’s time to ditch the performance metrics, but it does mean we can’t let them drive our performance management systems. What this analysis shows us is that PM success hinges on management. Systems with a dedicated performance leadership team, that provided regular actionable feedback, increased organisational performance by as much as three times that of systems that simply measured objectives. Interestingly, organisations that used benchmarking to rank employee performance also performed better, probably because leaders could see who was learning well and tailor their approach to individual needs. Management practices have a significant impact on the effectiveness of PM practices. Managing performance is more important than measuring it. PM systems with poor benchmarking are associated with lower performance. When Employee Performance Management Affects Individual Innovation in Public Organisations: The Role of Consistency and LMX. Firstly, let’s address the concept of ‘LMX’. An abbreviation of Leader-Member Exchange, it is basically a description of the relationship an individual has with their line manager, a relationship that impacts their experience of management and PM practices. High LMX means employees will experience management as supportive rather than controlling. This study took a detailed look at the working environment of 1095 caregivers in 68 care homes across Belgium. The data was collected with self-assessed questionnaires, and workers asked to grade performance management, LMX, and individual innovation on scales designed for each variable. (For those of you who are wondering, ‘individual innovation’ in this study refers to the tendency of workers to generate and implement new ideas). The long and short of it? Continuous monitoring and feedback in an environment where leaders and employees trust and respect each other leads to great LMX, and drives organisational performance by allowing individuals to innovate and improve workflows. A word of warning: new employees were found to experience higher LMX than their long-serving counterparts. So don’t overlook those individuals who’ve got their roles down – good performance management practices are just as important to them, arguably more so since it encourages individual innovation. 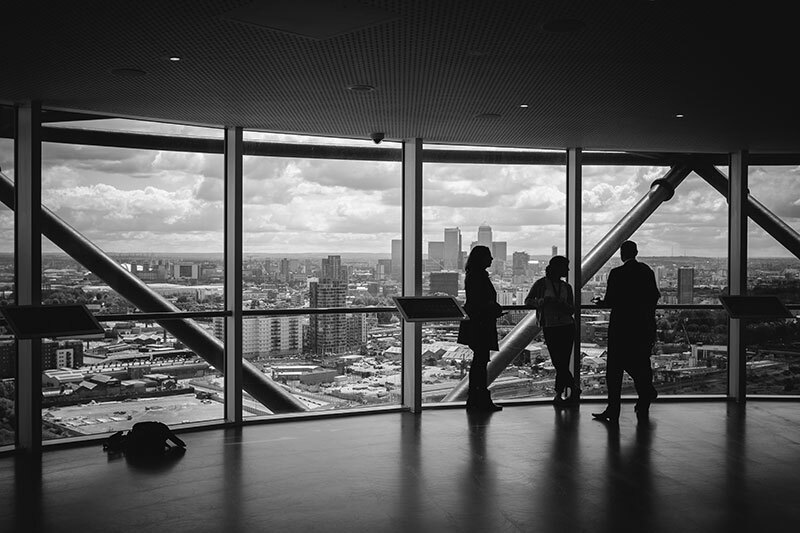 LMX has the biggest influence on employee perceptions of performance management practices. Great LMX creates high performing employees with a strong inclination to innovate and improve services. The best performance management systems are on-going, consistent, and personable. Employers have a tendency to undervalue the importance of performance management to long-serving employees. Do Similarities or Differences Between CEO Leadership and Organizational Culture Have A More Positive Effect on Firm Performance? A Test of Competing Predictions. The authors of this study set out to quantify the interaction between the CEO, organisational culture, and performance. They collected data from 119 CEOs in the software and hardware industries, and 337 members of their top management teams (TMT – think board executives). The TMT rated CEO leadership, the CEO and TMT rated organisational culture, and the unbiased Technology Consortium provided an objective measure of company performance. As the captain of the ship, the CEO’s impact on performance is multifaceted and far reaching. It is not, however, a case of one-size-fits-all. CEO behaviours that reduce performance in one organisation optimise it in another – and it’s organisational culture that determines which. There are two prevailing theories on this phenomena. The first is Similarity Theory, and it states that leaders who align their actions with organisational values send out a unified message to staff. Theoretically, these consistent cues drive everyone towards the same objectives and enhance performance. The alternative is Dissimilarity Theory, which suggests that leaders mirroring organisational values create redundancies. Rather than parroting the same values, CEOs take a contrasting approach, providing the support and frameworks missing from the organisational culture. The findings of this study suggest Dissimilarity Theory best describes the interaction between CEO behaviour, culture, and performance. Organisations where social interactions were not valued, were seen to benefit from CEOs with strong interpersonal skills and a social focus. Businesses that lacked strong performance-based goals performed better under results-driven leaders. CEO leadership behaviour has a significant impact on organisational performance. The interaction between CEO leadership and company culture has a critical impact on performance. CEOs are most effective when they provide the support missing from the organisational culture. What these three studies (and the host of others published on their heels) demonstrate is that, as an industry, we’ve still got a lot to learn about how our employees, leaders, and organisations interact with each other. With each year we gain more valuable, actionable insight. It’s up to us as managers and leaders to make the most of it, optimising our performance management systems to create processes that deliver tangible results at an individual, team, and organisational level. Organisations that implement regular performance feedback have 15% lower turnover rates than those that don’t. Source. 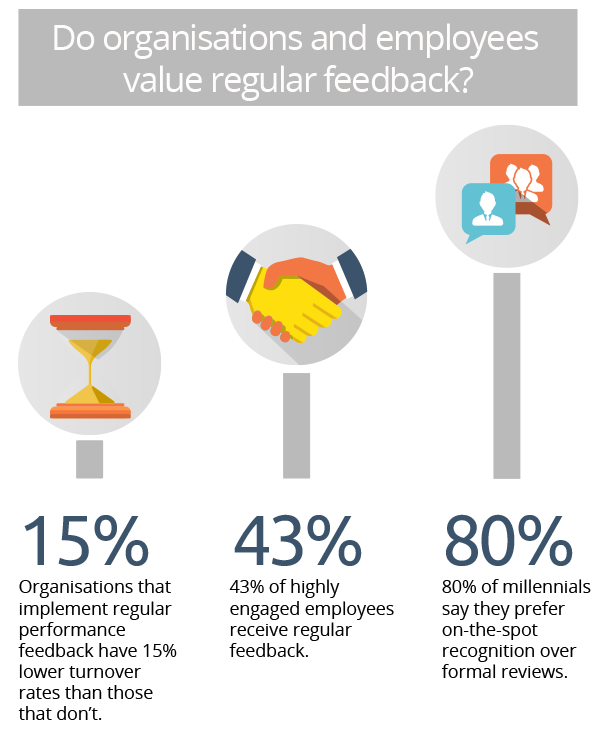 43% of highly engaged employees receive regular feedback. Source. 80% of millennials say they prefer on-the-spot recognition over formal reviews. Source.